Create a fun and festive Halloween card for a loved one or use this project to make invitations to a Halloween party. It's easy and the sequin embellishments really brighten up the card. Cut one 4.5" x 3.5" piece of Treasure Tape. Peel back the white liner and lay your green cardstock in the center of the sticky tape surface. Then center this piece, red liner side up, on the front of your card. Press out from the center with your fingers to remove any air pockets. Peel the red liner off your card and center the Trick or Treat strip on the card. Press to adhere securely. Place pieces of tape under each end of the strip to adhere them also. Punch a stamp shape in the center of your black star paper square. Center it on your card, on the green paper. Punch a stamp from your Mandarin Orange paper. Apply a small square of tape to the back. Peel the liner off and place the orange stamp shape inside the punched hole in the black paper so the edges match. Press to secure. Cut a small square of black paper and a piece of tape just slightly larger than the square. Peel the white liner off the tape and center it on the orange stamp shape. Peel back the red liner and center the paper square over it. 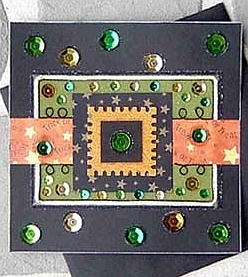 Begin embellishing your card. Use the Ribbon to make a border around the edge of the green paper. Use the Braid to make a looping design along the top and bottom of the Trick or Treat paper. Press the threads firmly into the tape, or use the Threadster tool to lay the thread. Use the Treasure Tape Dots to make a random design along the top and bottom of your card, in the center of your black square, and on each side of your Trick or Treat paper. Peel back the red liner on each dot, and apply a sequin. Add more sequins to your green paper, of varying sizes. When finished, place the card in a tray and pour Diamond Beadlets over the exposed tape. Swirl to cover fully, and tap to remove excess beadlets. Kreinik threads available through needlework stores or www.kreinik.com. For another Halloween card click here!